I have a book by Ruth Herring and Karen Manners, entitled Knitting Masterpieces, that has taken many of the great works of art and translated them into knitted sweaters. I love this book. I'm not sure that it is in print anymore; it was published in 1987. I have always wanted to "do" the Monet sweater. The cover of the book shows "Tahitian Women on the Beach" by Paul Gauguin. 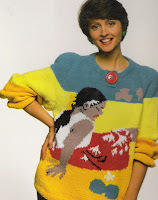 There is a total 20 sweaters in the book including the Mona Lisa, David and Cherubs by Raphael. Well this book and its sweaters are not the only ones that have linked great art and knitting. 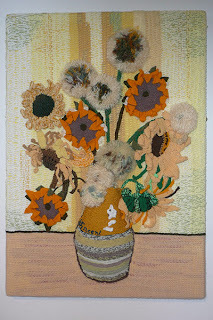 The Materialistics are a group of knitters in the UK that decide every year to take a famous work of art and re-do it in knitting. Be amazed; be very amazed!